It's beginning to look like Michele Bachmann really is going to have to reduce her visibility, at least for a while. Her hometown newspaper has some new revelations on the House Ethics Committee investigation. 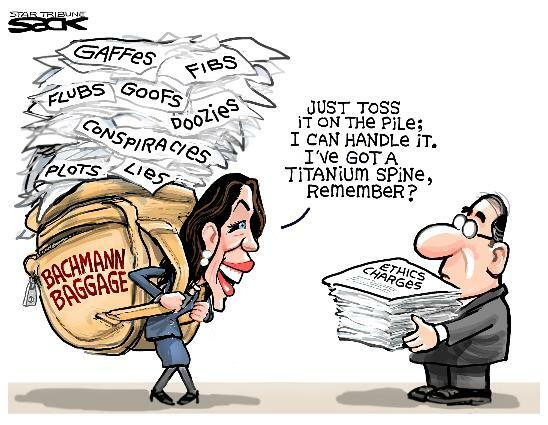 A congressional inquiry of U.S. Rep. Michele Bachmann has been referred to the House Ethics Committee, significantly raising the stakes in the Minnesota Republican’s efforts to fend off questions about her 2012 presidential campaign’s financial dealings. Now, if we could just get the DNC to put up and finance a Democratic candidate, we might actually pick up a seat. I guess I ask too much.